The cost of storing energy and meeting peak demand can be cut dramatically with a good combination of technologies and judicious use of available assets. Depleted gas fields in South Australia have provided a return on investment over a number of years and when reused for new purposes, save the need for investment in locating and tapping similar geological structures. A cutaway view of Solar Turbines' Taurus 70 engine, which is similar to a jet engine, but is used to generate electricity in power plants on the ground. Heat energy in a solar thermal turbine can be supplemented with natural gas when there is partial cloud cover. At night natural gas can take over from solar thermal heating. 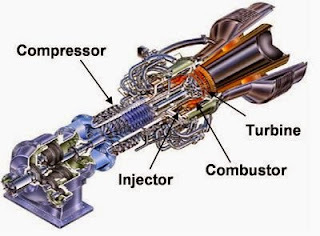 Whether a turbine engine is run on natural gas or solar thermal energy, about half the energy available from the turbine is used to power the compressor, leaving the other half to run a generator to supply electricity. That is, a gas turbine power station with a nameplate rating of 100 MW is actually able to produce 200 MW of energy - if it did not have to drive a compressor. Energy from renewable energy generators may be stored by driving compressors to compress air that is stored in depleted gas fields. The compressed air energy storage can deliver electricity to the grid when it is required by supplying it to a gas turbine generator, relieving the generator of the need to drive a compressor while it is being supplied with compressed air. 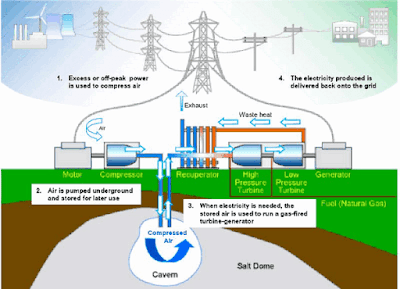 A solar thermal power station can store energy in a compressed-air energy store and use the compressed air at night to significantly reduce the amount of stored thermal energy or natural gas needed for operation. 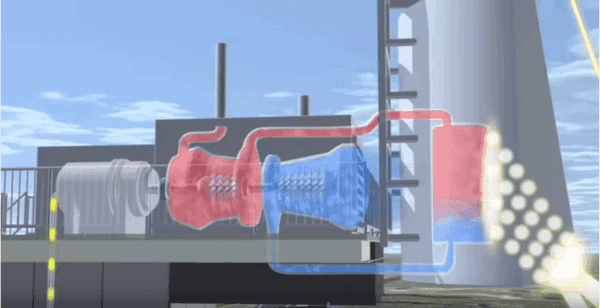 During peak demand periods, output from existing gas turbine generation plant can be quickly increased by reducing the energy used to drive compressors while supplying them with compressed air from storage.